Apple introduced a brand new case design with the Power Mac 7200 and 7500, one with a slide-off cover, an extra internal drive bay (compared to the Power Mac 7100 they replaced), and a flip-up drive/power supply assembly, providing easy access to the motherboard. What most differentiated the 7500 from the 7200 was a slot for a CPU daughter card. By pulling the 100 MHz PPC 601, the 7500 can be quickly upgraded to a faster, more efficient PPC 604, 604e, G3, or even G4. The 7500 also has video in ports on the rear. RAM: 16 MB, expandable to 512 MB using 70ns 168-pin DIMMs (8 sockets), Apple notes “128 MB DIMMs can be used, but have not been tested” – this would bring total RAM to 1 GB. Illustated Power Mac 7500 tear down, Steve Wood, Busman’s Holiday, 2001.07.23. The ins and outs of the 7200, 7300, 7500, and 7600 case. Accelerate Your Mac describes installing a PCI SCSI card and two-drive RAID array. 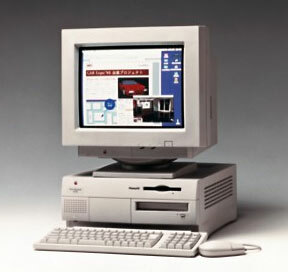 Apple Computer will consider this computer vintage as of 2001.07.16 in the United States and 2001.07.23 in Canada. As of that date, service parts will only be available for units purchased in California and being serviced within California. Because of the way the internal SCSI cable is routed in the 7300-7600, it is very easy for it to come loose from the motherboard while opening the case. Should this happen, be sure to plug it back into SCSI bus 0, not SCSI bus 1 (which is for the slower external SCSI port).